Our service starts picking you up from the Salaverry Port. Temples of the Sun and the Moon (1 hour), located on the Moche Valley, get amazed byt these flat-topped pyramids. The Pyarmid of The Sun was built with about 140 million adobes, while The Temple of the Moon. 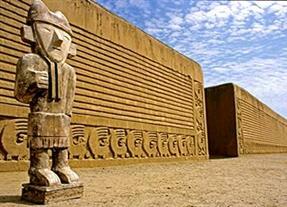 moche religious temple, holds the most stunning and best-preserved murals throughout Peru. The Pyramid of The Moon walls are beautifully decorated with polychrome friezes, depicting the Moche deity "Aia-paec" and different themes mythical and ceremonial themes and characters like snakes, prisioners, dragons alluding their ceremonial rituals. After our Muchik visit, we head to Trujillo beautiful colonial and historical center. Walking Colonial Tour: (50 minutes) Know the largest Main Square (Plaza de Armas) in Peru. It highlights the Freedom Monument, located in the center of the square. We also visit walk inside though the Uquiaga Ccolonial Mansion, which is also a Museum. We will observe and learn about the Cathedral and its beautiful paintings and altarpieces. Huanchaco fishing village, where you can see the "little reed horses", traditional pre-Columbian canoes which still are the main tool of the current Huanchaco's fishermen. You will also enjoy the great vibe of this place and the surroundings. We have prudential time to stroll until we go back to the transportation. We return to Salaverry Port. Arrival at the dock.